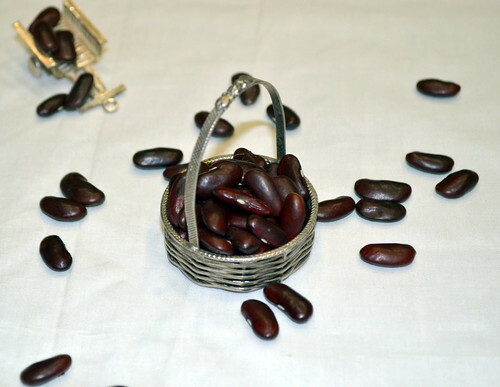 Wash the kidney beans 2 time and soak them in a bowl of water until needed.Alternatively you can soak the beans overnight or for 8 hours. Heat a tbsp of oil in a pan and add cinnamon,cloves,coriander seeds,cumin seeds and dried red chillies.Saute them till they change color,about 1-2 minutes,on low flame. Next add chopped onions,garlic and ginger and saute till onions turn transcendent,abut 3 minutes.Switch off the gas and let it come to room temperature. 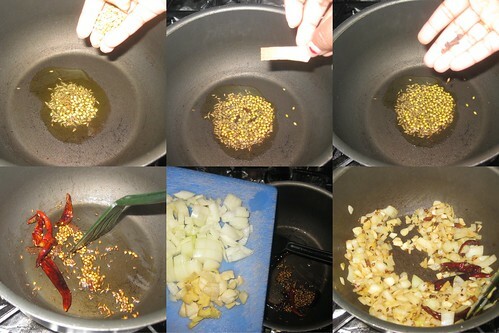 Once the onion mixture has cooled down enough,grind them to smooth paste without any water. Next heat a tbsp of oil in a pressure cooker and add ground mixture to it.Mix in crushed kasuri methi mix well. 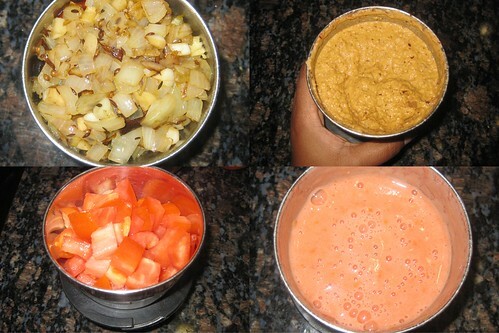 Add tomato paste and pureed tomatoes,and cook for 2-3 minutes. 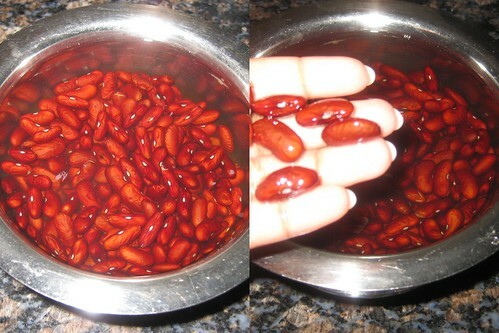 Drain and add the kidney beans ,3-4 cups of water depending on how thick you want the gravy and salt to taste. Cover the lid and place the weight on.Let it cook for 20-25 minutes or for 3-4 whistles on medium-high flame. 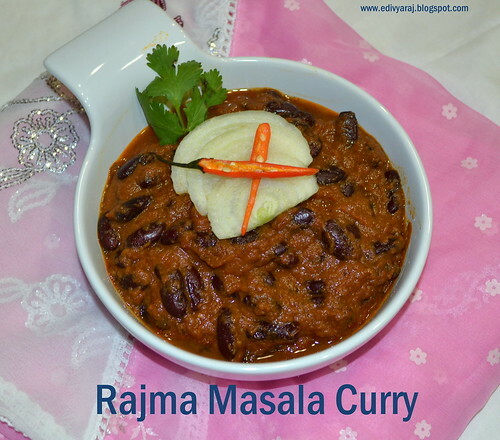 Serve this creamy delicious rajma masala. Super yummy rajma masala..looks so tempting. Rajama masala looks delicious Divya. delicious rajma masala with awesome clicks. Delicious Rajama masala looks yummy. love rajma. the curry looks delicious. 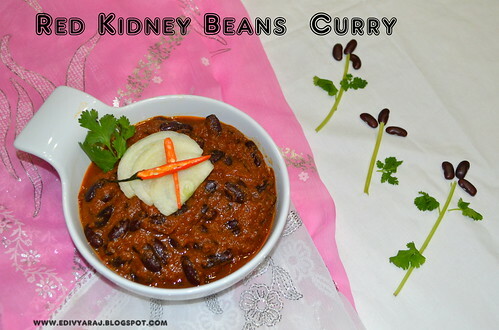 Thanks for sharing this yummy bean curry! Delicious rajma masala, it is very nice to eat with a bowl of rice. I love rajma!!! Especially with pasta and topped with a dollop of yogurt! Your recipe looks great! Rajma masala looks yummy, I love its dark red color!! very inviting and yummy dish ! healthy too..and hey ! feel free to drop by my space too when you get the time. just posted on some handy parenting tips to "sane motherhood" on my "pick quicks" blog. Hope you will be a follower there as well. lets stay connected, beyond the kitchen. This was in my to do list for log time to click:( Every time I make it and end up with out clicking them..yours looks super good..
Great clicks and so yum! Nutritious and fantabulous masala, love with rotis. Delicious-looking rajma and the photographs look amazing.